The IAEA offers challenging assignments in a stimulating multicultural workplace. It has around 2,500 staff members from over 100 countries with expertise in a variety of scientific, technical, managerial and professional disciplines. Most staff members work at the Agency’s headquarters in Vienna, Austria. The Agency’s Headquarters is in Vienna, Austria, where the majority of staff is located. The IAEA also maintains regional offices in Toronto and Tokyo, liaison offices in New York and Geneva, and research laboratories in Seibersdorf, Austria, and in Monaco. The IAEA offers a variety of work arrangements to meet the needs of its diverse staff. This includes flexible working hours, part-time work and job-sharing arrangements. The IAEA has a generous benefits and entitlements package, including paid time off, maternity and paternity leave, health insurance, a pension programme, education grants, and other benefits, which are determined by type of contract. The IAEA accepts a limited number of interns each year. The internships are awarded to persons studying towards a university degree or who have recently received a degree (see Internship web pages for further details). To benefit the IAEA’s programmes through the assistance of qualified students specialized in various professional fields. The duration of an internship is normally not less than three months and not more than one year. The Department of Nuclear Safety and Security (NS) formulates and implements the IAEA’s nuclear safety and security programme, which encompasses the Agency’s activities to protect people and the environment from radiation exposure and responds to the safety and security related needs of its Member States. The Incident and Emergency Centre (IEC) is part of the Department of Nuclear Safety and Security and reports to the Deputy Director General, Head of the Department. 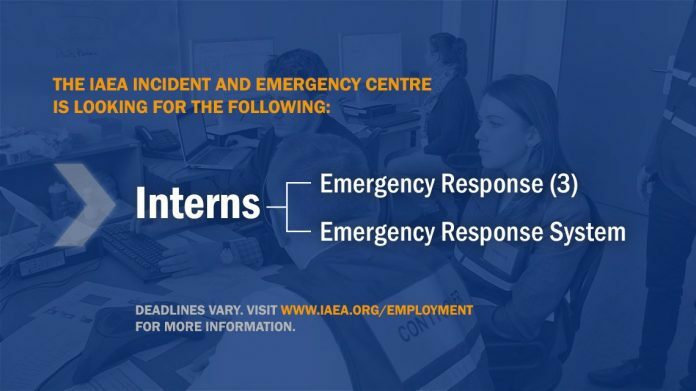 The IEC serves as the IAEA’s focal point for preparedness and response to nuclear and radiological incidents and emergencies regardless of their cause, and for strengthening Member States’ preparedness for response. The main purpose of this internship is to support IEC staff in updating accident scenarios for use in ConvEx exercises and in particular the ConvEx-2b exercises. Assist in the development and revision of training materials in emergency preparedness and response by providing technical research, analysing various feedback, drafting proposals to address the feedback obtained, maintaining records, editing and updating the draft materials. University degree in Natural Sciences (i.e. Chemistry, Physics, Health Physics), Nuclear Engineering or a related field. Knowledge and interest in emergency preparedness and response activities. Candidates must be a minimum of 20 years of age and have completed at least three years of full-time studies at a university or equivalent institution towards the completion of a first degree. Candidates may apply up to one year after the completion of a bachelor’s, master’s or doctorate degree. Candidates must not have previously participated in the IAEA’s internship programme. Excellent written and spoken English essential. Candidates must attach two signed letters of recommendation to their application. المادة السابقةKenya Airways Internship Program 2019 for young Kenyan University and college students.